Dimapur, April 4 (EMN): Easterine Kire and Kethoser Aniu Kevichusa have been declared winners of the first Gordon Graham Prize for Naga Literature. Kire was awarded for her fiction ‘When the River Sleeps’; Kevichusa’s ‘Forgiveness and Politics’ got him the honours in non-fiction. The award is an initiative of the Kohima Educational Trust (UK) and Kohima Educational Society (Nagaland). “The prize was instituted in order to recognise and reward the knowledge-keepers and idea-givers in Naga society and to encourage and promote reading and writing within the Naga community. 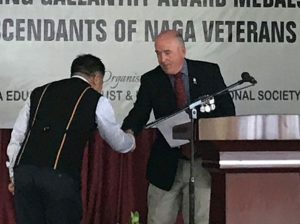 It is intended to give visibility to rational discourse in society and to help bring the thinking elements in Naga society to play a more effective role in the larger life of the community and society,” according to the organisers. The winners were selected from eight books by “three independent judges from among well-known authors and intellectuals”, it informed. For each winner, the award carries a cash prize of INR 1 lakh and a certificate. They will be presented with the award by Chief Minister Neiphiu Rio; and the managing trustee and CEO of KET, Sylvia May at Hotel Vivor in Kohima on April 9.